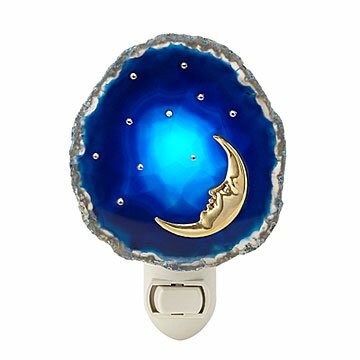 Michael Dancer recreates the night sky with blue agate, crystal stars, and a friendly steel moon. A light like this one comes around once in a blue moon. Michale Dancer's tribute to the night sky features a slice of blue agate, shimmering crystal stars, and a steel moon with a warm expression. As light filters through the stone and crystals, it casts a warm glow to help you see on your way to the bathroom or kitchen for a late-night drink of water. Give one to a star-gazing friend or loved one, and help them drift off peacefully into dream land. Handmade in Corte Madera, California. Michale Dancer, a creative director and product developer, has been involved in the fashion, architectural and interior design profession for most of her life. She became an entrepreneur at an early age, when she started one of the first vintage clothing stores in New York City. Then, she developed a fashion manufacturing company, was Director of Interior Design at Macy's San Francisco and was an Architectural Consultant for DuPont. Her family business is based in Northern California. As long time naturalists, they have discovered a beautiful and timeless form in which to preserve nature. By preserving botanicals, shells, spices, food and other interesting forms with precious metals, heirloom quality gifts that are unique, timeless and classic are born. Read a Q&A with Michale or visit her studio on our blog.